Circulate San Diego has proposed alleviating the affordable housing crunch by transforming Metropolitan Transit System (MTS) parking lots into low-income housing. 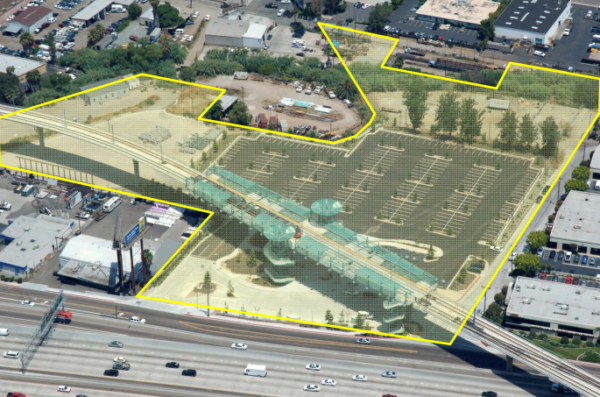 The transportation and land-use think tank’s suggestion was published recently in a report titled “Real Opportunity.” The report reveals MTS has at least 57 acres of available property, much of it underutilized transit parking lots. Circulate San Diego estimates those marketable MTS properties could support development of 8,000 new dwelling units, of which 3,000-plus could be reserved as permanently affordable low-income housing. While questioning MTS’s calculations, Rob Schupp, director of marketing and communications for MTS, San Diego’s public transit service, said the agency is receptive. “All of our properties are available,” said Schupp pointing out 8,000 units on 57 acres translates into 140 units per acre. AB 2372 would allow local governmental jurisdictions to provide developers with a density bonus and other incentives or concessions for producing lower-income housing. 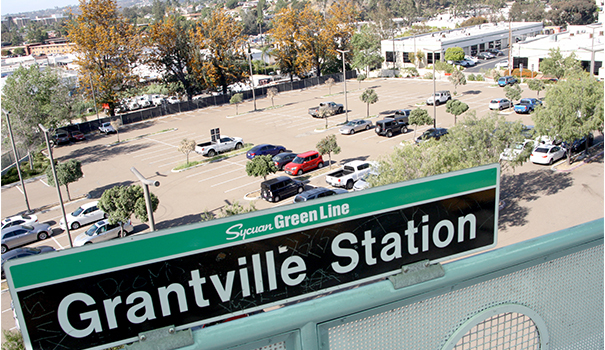 Parent cited the Grantville Trolley Station as a prime example of an MTS parcel that could be put to better re-use. The San Diego Housing Federation is a nonprofit advocate for affordable housing. The agency’s executive director, Stephen Russell, said the housing crisis is so acute, especially at the low end, that any additions to the available housing stock are direly needed and welcome. Russell pointed out the seriousness of San Diego’s housing shortage is confirmed by the current numbers. He cited 5 percent as the threshold figure indicating the dividing line separating surplus from shortage in the housing market. Enter Mario Turner, vice president of Orange-County based AMCAL Multi-Housing, Inc. which builds affordable housing throughout Southern California, including San Diego. AMCAL presently has an affordable housing project, Villa Encantada at 505 62nd St. and Imperial, under construction. Villa Encantada is the redevelopment of an underutilized parking lot next to a trolley station on 1.7 acres, which will include 67 low-income family apartments offering replacement parking for MTS while providing 1,000 square feet of retail space. Noting Villa Encantada is “San Diego’s first affordable-housing, transit-oriented development,” Turner added the project has been in the pipeline since 2011. Asked about Villa Encantada’s significance in the affordable housing market, Turner replied, “It’s the future.” He adding finding suitable properties is problematic. Then of course, said Turner, there is the all-important issue of obtaining financing. “Big-lender investors in affordable housing, they aren’t always enough,” said Turner noting financing for Villa Encantada involved acquiring a mixture of public-private financing including state grants and loans, tax credit equity and other sources. “You need multiple layers of financing to bring down the rents for folks that are in the lowest income levels,” he said. Turner believes MTS is ideally constituted to contribute to the effort to alleviate the affordable housing crisis. “If you look at their presence in the region, and their underutilized parking lots, you have one of the pieces of the puzzle needed to resolve our future low-income housing needs,” he said. Create a joint development program that issues requests for proposals for priority sites while actively soliciting development partners. Require any residential development to include a percentage of homes to be made permanently affordable for low-income families. Eliminate the costly requirement for new developments to replace or maintain parking where it is already underutilized. “With the new leadership on the MTS board, we believe that the transit agency has a real opportunity to transform its empty parking lots into affordable homes,” concluded Parent. — Dave Schwab is a San Diego-based freelance writer. Reach him at dschwabbie@journalist.com.